D.-Y. Khang, J.A. Rogers and H.H. Lee, “Mechanical Buckling: Mechanics, Metrology, and Stretchable Electronics,” Advanced Functional Materials 18, 1-11 (2008). J.-U. Park, J.H. Lee, U. Paik, Y. Lu and J.A. Rogers, “Nanoscale Patterns of Oligonucleotides Formed by Electrohydrodynamic Jet Printing with Applications in Biosensing and Nanomaterials Assembly,” Nano Letters 8(12), 4210-4216 (2008). Q. Cao and J.A. Rogers, “Ultrathin Films of Single-Walled Carbon Nanotubes for Electronics and Sensors: A Review of Fundamental and Applied Aspects,” Advanced Materials 20, 29-53 (2008). T. Song, J.W. Choung, J.-G. Park, W.I. Park, J.A. Rogers and U. Paik, “Surface Polarity and Shape-Controlled Synthesis of ZnO Nanostructures on GaN Thin Films Based on Catalyst-Free Metalorganic Vapor Phase Epitaxy,” Advanced Materials 20, 4464–4469 (2008). D.-H. Kim, J. Song, W.M. Choi, H.-S. Kim, R.-H. Kim, Z. Liu, Y.Y. Huang, K.-C. Hwang, Y. Zhang and J.A. Rogers, “Materials and noncoplanar mesh designs for integrated circuits with linear elastic responses to extreme mechanical deformations,” Proceedings of the National Academy of Sciences USA 105(48), 18675–18680 (2008). D.-H. Kim and J.A. 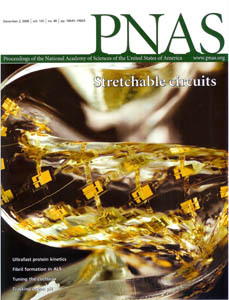 Rogers, “Stretchable Electronics: Materials Strategies and Devices,” Advanced Materials 20, 4887-4892 (2008). Q. Cao and J.A. Rogers,” Random Networks and Aligned Arrays of Single-Walled Carbon Nanotubes for Electronic Device Applications,” Nano Research 1, 259-272 (2008). J. Yoon, A.J. Baca, S.-I. Park, P. Elvikis, J.B. Geddes, L. Li, R.H. Kim, J. Xiao, S. Wang, T.H. Kim, M.J. Motala, B.Y. Ahn, E.B. Duoss, J.A. Lewis, R.G. Nuzzo, P.M. Ferreira, Y. Huang, A. Rockett and J.A. Rogers, “Ultrathin Silicon Solar Microcells for Semitransparent, Mechanically Flexible and Microconcentrator Module Designs,” Nature Materials 7, 907-915 (2008). A.A. Pesetski, J.E. Baumgardner, S.V. Krishnaswamy, H. Zhang, J.D. Adam, C. Kocabas, T. Banks and J.A. Rogers, “A 500 MHz Carbon Nanotube Transistor Oscillator,” Applied Physics Letters 93, 123506 (2008). X. Dong, C.M. Lau, A. Lohani, S.G. Mhaisalkar, J. Kasim, Z. Shen, X. Ho, J.A. Rogers and L.-J. Li, “Electrical Detection of Femtomolar DNA via Gold-Nanoparticle Enhancement in Carbon-Nanotube-Network Field-Effect Transistors,” Advanced Materials 20, 2389–2393 (2008). S.-I. Park, J.-H. Ahn, X. Feng, S. Wang, Y. Huang and J.A. Rogers, “Theoretical and Experimental Studies of Bending of Inorganic Electronic Materials on Plastic Substrates,” Advanced Functional Materials 18, 2673–2684 (2008). J.-H. Ahn, Z. Zhu, S.-I. Park, J. Xiao, Y. Huang and J.A. Rogers, “Defect Tolerance and Nanomechanics in Transistors that Use Semiconductor Nanomaterials and Ultrathin Dielectrics,” Advanced Functional Materials 18, 2535-2540 (2008). D. Shir, H. Liao, S. Jeon, D. Xiao, H.T. Johnson, G.R. Bogart, K.H.A. Bogart and J.A. Rogers, “Three-Dimensional Nanostructures Formed by Single Step, Two-Photon Exposures through Elastomeric Penrose Quasicrystal Phase Masks,” Nano Letters 8(8), 2236-2244 (2008). J. Xiao, H. Jiang, D.–Y. Khang, J. Wu, Y. Huang and J.A. Rogers, “Mechanics of Buckled Carbon Nanotubes on Elastomeric Substrates,” Journal of Applied Physics 104, 033543 (2008). H.C. Ko, M.P. Stoykovich, J. Song, V. Malyarchuk, W.M. Choi, C.-J. Yu, J.B. Geddes, J. Xiao, S. Wang, Y. Huang and J.A. 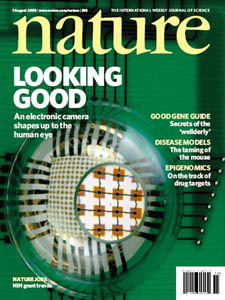 Rogers, “A Hemispherical Electronic Eye Camera Based on Compressible Silicon Optoelectronics,” Nature 454, 748-753 (2008). D.-H. Kim, W.M. Choi, J.-H. Ahn, H.-S. Kim, J. Song, Y. Huang, Z. Liu, C. Lu, C.G. Koh and J.A. Rogers, “Complementary Metal Oxide Silicon Integrated Circuits Incorporating Monolithically Integrated Stretchable Wavy Interconnects,” Applied Physics Letters 93, 044102 (2008). Q. Cao, H.-S. Kim, N. Pimparkar, J.P. Kulkarni, C. Wang, M. Shim, K. Roy, M.A. Alam and J.A. Rogers, “Medium-Scale Carbon Nanotube Thin-Film Integrated Circuits on Flexible Plastic Substrates,” Nature 454, 495-500 (2008). S. Wang, J. Song, D.-H. Kim, Y. Huang and J.A. Rogers, “Local Versus Global Buckling of Thin Films on Elastomeric Substrates,” Appl. Phys. Lett. 93, 023126 (2008). A.J. Baca, J.-H. Ahn, Y. Sun, M.A. Meitl, E. Menard, H.-S. Kim, W.M. Choi, D.-H. Kim, Y. Huang and J.A. 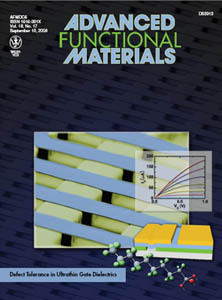 Rogers, “Semiconductor Wires and Ribbons for High-Performance Flexible Electronics,” Angewandte Chemie International Edition 47, 5524 – 5542 (2008). J. Xiao, A. Carlson, Z.J. Liu, Y. Huang, H. Jiang and J.A. Rogers, “Stretchable and Compressible Thin Films of Stiff Materials on Compliant Wavy Substrates,” Applied Physics Letters 93, 013109 (2008). T.-H. Kim, W.M. Choi, D.-H. Kim, M.A. Meitl, E. Menard, H. Jiang, J.A. Carlisle and J.A. Rogers, “Printable, Flexible, and Stretchable Forms of Ultrananocrystalline Diamond with Applications in Thermal Management,” Advanced Materials 20, 2171–2176 (2008). J. Yao, M.E. Stewart, J. Maria, T.-W. Lee, S.K. Gray, J.A. Rogers and R.G. 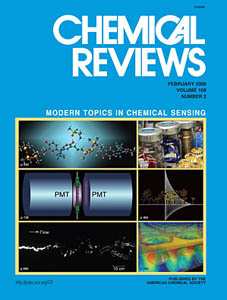 Nuzzo, “Seeing Molecules by Eye: Surface Plasmon Resonance Imaging at Visible Wavelengths with High Spatial Resolution and Submonolayer Sensitivity,” Angewandte Chemie International Edition 47, 5013-5017 (2008). M.J. Schultz, X. Zhang, S. Unarunotai, D.-Y. Khang, Q. Cao, C. Wang, C. Lei, S. MacLaren, J.A.N.T. Soares, I. Petrov, J.S. Moore and J.A. Rogers, “Synthesis of Linked Carbon Monolayers: Films, Balloons, Tubes, and Pleated Sheets,” Proceedings of the National Academy of Sciences USA 105(21), 7353-7358 (2008). J.A. 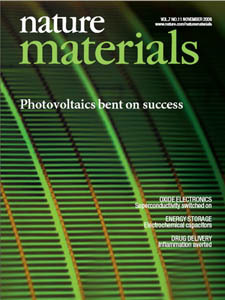 Rogers, “Electronic Materials: Making Graphene for Macroelectronics,” Nature Nanotechnology 3, 254-255 (2008). J. Chae, X. Ho, J.A. Rogers and K. Jain, “Patterning of Single Walled Carbon Nanotubes Using a Low-Fluence Excimer Laser Photoablation Process,” Applied Physics Letters 92, 173115 (2008). D.-H. Kim, J.-H. Ahn, W.-M. Choi, H.-S. Kim, T.-H. Kim, J. Song, Y.Y. Huang, L. Zhuangjian, L. Chun and J.A. Rogers, “ Stretchable and Foldable Silicon Integrated Circuits,” Science 320, 507-511 (2008). H.K. Choi, J.-U. Park, O.O. Park, P.M. Ferreira, J.G. Georgiadis and J.A. Rogers, “Scaling Laws for Jet Pulsations Associated with High-Resolution Electrohydrodynamic Printing,” Applied Physics Letters 92, 123109 (2008). J. Song, H. Jiang, Z.J. Liu, D.Y. Khang, Y. Huang, J.A. Rogers, C. Luc and C.G. Koh, “Buckling of a stiff thin film on a compliant substrate in large deformation,” International Journal of Solids and Structures 45, 3107–3121 (2008). M.E. Stewart, C.R. Anderton, L.B. Thompson, J. Maria, S.K. Gray, J.A. Rogers and R.G. Nuzzo, “Nanostructured Plasmonic Sensors,” Chemical Reviews 108, 494-521 (2008). J.A. Rogers, “Optoelectronic Tweezers: Organizing Nanowires,” Nature Photonics 2, 69-70 (2008). D.-Y. Khang, J. Xiao, C. Kocabas, S. MacLaren, T. Banks, H. Jiang, Y.Y. Huang, and J.A. Rogers, “Molecular Scale Buckling Mechanics in Individual Aligned Single-Wall Carbon Nanotubes on Elastomeric Substrates,” Nano Letters 8(1), 124-130 (2008). J. Song, H. Jiang, W. M. Choi, D. Y. Khang, Y. Huang and J. A. Rogers, “An Analytical Study of Two-Dimensional Buckling of Thin Films on Compliant Substrates,” Journal of Applied Physics 103, 014303 (2008). D.-H. Kim, J.-H. Ahn, H.-S. Kim, K.J. Lee, T.-H. Kim, C.-J. Yu, R.G. Nuzzo and J.A. Rogers, “Complementary Logic Gates and Ring Oscillators on Plastic Substrates by Use of Printed Ribbons of Single-Crystalline Silicon,” IEEE Electron Device Letters 29(1), 73-76 (2008).